In 2015, Sylvia and Brittany Stockwell ran into each other at a yoga class. Sylvia had played violin and viola with Brittany at Whitinsville Christian School. Sylvia presented the idea of collaborating as teachers and performers, but Brittany was in the middle of working on her masters in teaching and was too busy to take Sylvia up on her offer at that time. The following year, the Whitinsville Christian School Strings celebrated 35 years with a reunion concert. After reuniting and performing together once again, Brittany was convinced to start working on starting a quartet and music business with Sylvia! Sylvia and Brittany both play violin and viola in the BVQ. Initially it seemed difficult to complete their quartet of musicians. Eventually the Blackstone Valley String Quartet evolved to incorporate Jamie Thiesing (cello) and Laura Sousa Wagner (violin) as resident members along with Sylvia and Brittany. All four young women grew up playing together in the WCS strings program! The Blackstone Valley String Quartet & Ensembles is a dream a long time coming for owner, resident member, and founder Sylvia DiCrescentis. When the BVQ became a reality in the fall of 2016, Sylvia had already been running her own teaching studio, Vivo Strings, in North Grafton, Massachusetts for five years. Although having a passion for and a degree in music education, she always desired to perform and collaborate with other professional musicians. Being a product of the well-known Whitinsville Christian School Strings Program during her middle and high school years, it is no surprise she would eventually team up with fellow musicians from the very same program to realize this dream. Laura Sousa Wagner (right), Brittany Stockwell (back), Jamie Thiesing (front), Sylvia DiCrescentis (right). As the 2017 wedding season progressed and the BVQ booked more and more gigs it was obvious for the business to continue to be successful it needed to expand. By the Fall of 2017, the BVQ became the BVQ & Ensembles. Sylvia and Brittany brought on several other WCS strings alum as well as other professional musicians they had worked with to become ensemble members. This enabled the business to offer various ensemble options beyond just a string quartet. The BVQ & Ensembles now offers any combination of violin, viola, cello, piano, guitar, and flute. Along with performing several times a week, weekly rehearsals as a quartet, and independent practice sessions as individuals, there is a lot of behind the scenes work that goes into making the overall business run! To make any type of music business successful there is a crazy amount of hustle that happens in front of the curtain but even more so behind the scenes! 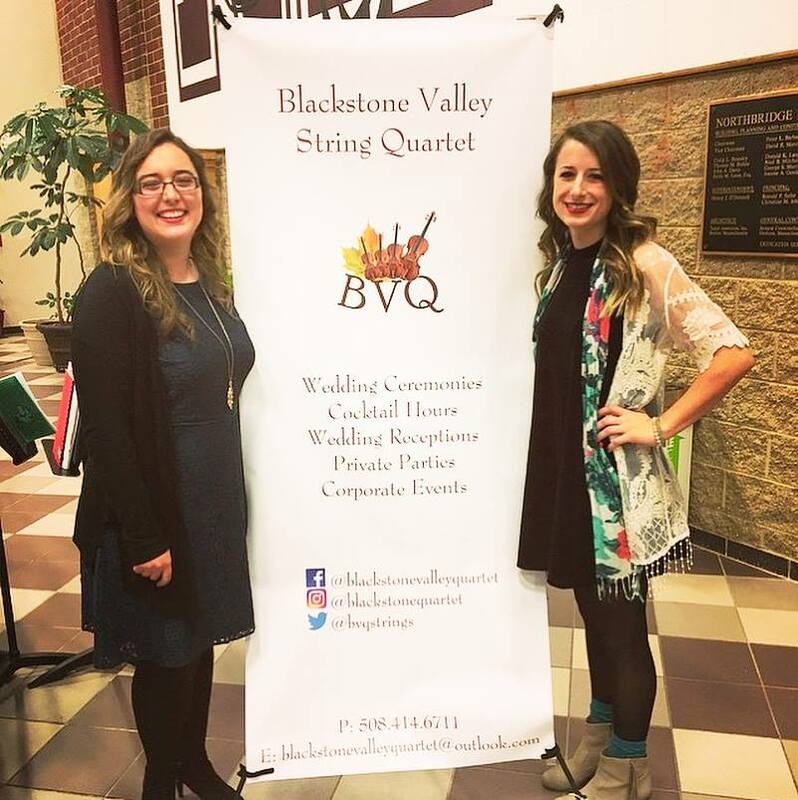 The first year of business for the BVQ & Ensembles has been an exciting journey which has encouraged Sylvia and Brittany to learn how to balance the business in a way that always puts the music first. Sylvia, because of her experience with running her own independent teaching studio for five years as business owner and violin/viola/cello/piano teacher, overseas all of the financial aspects of the BVQ & Ensembles. As Booking Manager, Sylvia also handles all contact and bookings with clients. She also spends a lot of time arranging songs so that the BVQ can honor any request (song & ensemble) made by a client. Laura Sousa Wagner, the newest resident member of the BVQ is also working hard behind the scenes arranging songs. Brittany is our blogger extraordinaire, using her experience as an English major and educator to craft blogs containing information about events and education about weddings and music! If you haven’t already, make sure to check out our social media channels!